Hardwood decking is the perfect way to turn your backyard, front porch or side area into a living space for you to enjoy and entertain on. A brand new deck will provide you with endless amounts of enjoyment – whether you’re barbecuing up a storm on a Sunday, kicking back with friends on a balmy Saturday night or just relaxing with a book on a sunny afternoon, a deck is the perfect place for your leisure time. 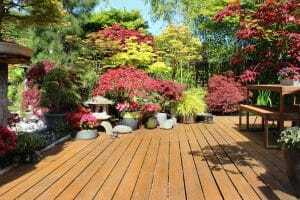 We have been designing and constructing hardwood decks for over 20 years. During that time we’ve seen trends and styles come and go but one thing has stayed the same – our unbeatable craftsmanship and our ability to leave our customers happy every time. We source only the highest quality hardwood and make sure it is installed and treated in such a way that it will last for decades. We can create a deck to suit any space and we have a huge back catalogue of customers to prove it. If you’re thinking about adding a hardwood deck to your backyard, contact us today and we’ll pop by for a visit and a quote. Why Choose Everlast for Your Hardwood Decking? We love where we live and we want to make sure that we’re doing everything we can to support this area and protect all the things that make it so amazing. That’s why we’re 100% Australian owned and operated and always will be. We always go with local products and materials first because we want to make sure that our dollar goes back into the local economy. Our craftsmanship doesn’t come with a huge price tag. In fact, we love providing our customers with hardwood decking at an affordable price. Don’t assume it’s too expensive, give us a call – you’ll be pleasantly surprised. If you’re going to invest in a deck, you want to make sure you’ve got someone you can trust. 20 years of experience is something you can count on. We can help you design and build a deck that you’ll love, and we’ll also provide you with all the information you need to look after it. If you’re looking to completely beautify your backyard, why not take advantage of our full suite of landscaping services. Our talented landscaping team can take care of the entire project, from the design to the installation and construction and if you want to take care of things yourself we can even provide you with all the supplies you need.